I’m a huge fan of Kagawa’s writing. I have the Iron Fey series sitting on my shelf, and I really enjoyed The Immortal Rules. Suffice to say I was thrilled that she was continuing the Iron Fey series with Meghan’s younger brother, Ethan. The biggest thing that struck me about The Lost Prince was how hard it must be to write a new series in a world that readers have already come to love. I really enjoyed Ethan’s story, but I was continually reminded of how much more I enjoyed Meghan, Ash, and Puck’s story. Our favorite trio just seemed more interesting, more endearing, and more entertaining than Ethan, Kenzie, and Kierran. This was most apparent when Puck, Ash and Meghan themselves showed up in The Lost Prince; they lit up the pages in a way that our current hero was unable to. I found myself almost giddy when the Iron Queen appeared, or when there was a short exchange between Puck and Ash. Of course, after four books, you feel as if beloved characters are good friends, so it was hard to see a new hero take the spotlight. All that sap being said, this book does a fantastic job continuing the world and the story that Kagawa created through the trio in the first books. All the imagination and creative storytelling is there, illustrating the dark and fascinating Nevernever. The main conflict is a follow up from The Iron Fey, centering around the mysterious beings known as The Forgotten. They fit perfectly into the world Kagawa has shaped, making it feel less and less like a spin-off the deeper our heroes get into trouble. As I said previously, I didn’t like the main characters as much as Ash, Meghan, and Puck. In some ways that’s not fair, because if I hadn’t read the original series, I wouldn’t know any better. It seems as though everyone in this book is seriously damaged. Ethan has to keep everyone at arm’s length (if not farther) to keep them safe from the fey. He’s a jerk to everyone, but he loathes himself for it. You really feel bad for him, having to constantly look over his shoulder, making sure the fey aren’t messing with him. The only person stubborn enough to break through his armor is Kenzie, who refuses to back down even when he is repeatedly rude to her. Kenzie was fiery, brave…I liked her. She responded to all the crazy faerie stuff well; she was shocked, astonished, disbelieving, and then she realized there was nowhere to go but forward, so she just went with it. I liked her a lot. Her confession near the end seemed completely out of the blue, and I wasn’t really sure why Kagawa chose to add it. I’ll be interested to see how it affects the story later on. Kierran. I really really really wanted to love him. And I liked his character, don’t get me wrong. But he was too…static. A little boring. I wanted him to be more Puck-ish, with a huge personality, probably because Ethan was quite Ash-like with his brooding and his bad-boy behavior, and I was looking for the foil that I just didn’t quite find in Kierran. But then again, I’m comparing the two series, which isn’t fair. Kierran is a very romantic character, a nice mix between Ash and Puck, so there’s that. Grimalkin plays a huge part in The Lost Prince, which made me exceptionally happy. It was fun having our favorite feline at the helm again, mysteriously leading our heroes around. 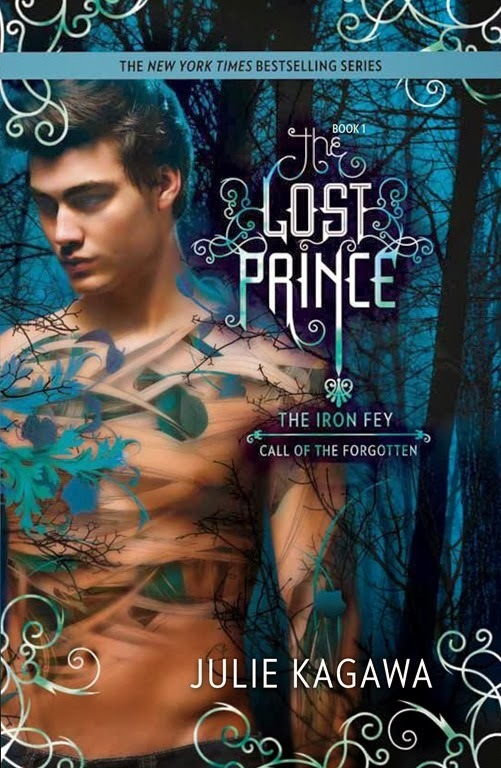 Fans of Kagawa’s should NOT miss this book, and it’s a book that I think will satisfy lovers of The Iron Fey series. I don’t think it’s absolutely necessary to read The Iron Fey first, but it would certainly give you a lot of back story, as there are four books worth of material there to explain the Nevernever and give Ethan’s history. I’m very excited about The Iron Traitor, which is sitting on my Kindle, waiting to be read. This entry was posted in Book Reviews, Romance, YA and tagged Paranormal, Romance, YA.